Heritage Festival event is booked out. We hope to run this walk again in July. It is a short walk from the car park to Duntroon Dairy, a remarkable survivor of farming days. 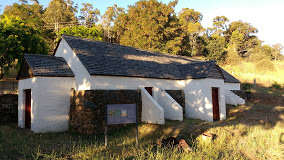 The dairy, built in about 1832, is the oldest building on Duntroon Estate and is believed to be Canberra’s oldest extant European building. From the Dairy, we will enter the grounds of Duntroon following an early road above the Molonglo River with views across the Limestone Plains. Duntroon was the second property to be established on the Limestone Plains. It was named by Robert Campbell after his family castle, Duntrune Castle in Scotland. In 1833, Campbell built Duntroon House out of stone with wide verandahs. A two storey extension in Victorian Gothic style was added to by his son, George in 1862. In 1910 Duntroon was recommended as the site for Australia’s Royal Military College which opened in June 1911 which still operates there. On the walk around the grounds of Duntroon, you will see the Parade Ground, Waller Lodge (original gate house), various houses built as staff residences for the College, Changi Chapel – the National Prisoner of War Memorial and the exterior of Duntroon House. We will return through the garden to our cars near Duntroon Dairy. Our guide will be Eric Martin, heritage architect, who has worked on the conservation of buildings at Duntroon. This Heritage Walk is also a Canberra and Region Heritage Festival event.